The 2017 Five Boro Bike Tour is Sunday, May 7th. 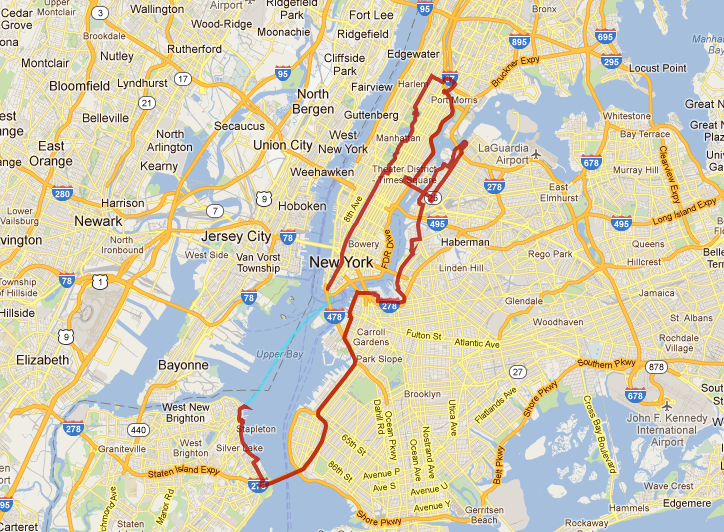 New York’s Five Boro Bike Tour is the largest recreational cycling event in the United States. Every year on the first Sunday of May, over 30,000 riders participate in the 40 mile ride around New York City. The route, closed to automobile traffic, takes riders through all five boroughs of New York City, across five major bridges, and finally across New York Harbor on the Staten Island Ferry. It is a lot of fun for cyclists of all skill sets and highly recommended. The Tour begins in Lower Manhattan in staggered start waves, which correspond to the color of your bib and bike plate (which you’ll receive when you pick up your rider packet at the Expo). In the event that members of your group are assigned to different start waves, please ride together in a later wave. Check back for more details. No bags with shoulder straps (including backpacks and hydration packs), no panniers or bags that hang on the side of your bike, no covered baskets, and no bags over 420 cubic inches. Note that in accordance with the criteria above, the Manhattan Portage bag that is included in the VIP package will not be allowed on the Tour. The RIK, which you will receive in your rider packet, comprises a helmet cover, bib, and bike plate. The complete RIK must be visible at all times in order to participate in the Tour. Wear your helmet. No ifs, ands, or buts about it. Have your RIK visible at all times: attach the bike plate to your handlebars, affix the bib to your chest, and wear your helmet cover. You will be asked to leave the Tour if any element of your RIK is missing. Use hand signals to indicate that you are slowing down, stopping, turning, or changing lanes. Move completely off the road if stopping for any reason. Do not ride against the flow of the Tour. Do not use your cell phone while riding. Maintain adequate distance between yourself and other cyclists—especially on downhills. Control your speed and be prepared to slow down for congestion or road hazards. Keep at least one hand on the handlebars at all times. Do not wear earbuds or any other form of headphones. Slow down when approaching a security checkpoint and make sure your complete RIK is visible. No photos on bridges or their access points. Your camera may be confiscated. Cash for spare parts, parking, food and merchandise at the Finish Festival, etc. Photo identification—you may be asked to show it. An extra bike tube; make sure they’re the correct size with the correct valve—either Presta or Schrader. Finish Festival: The Finish Festival at Fort Wadsworth in Staten Island is closed to the public. By the time you reach the Finish Festival at Fort Wadsworth in Staten Island, you will have conquered five boroughs and five bridges—including the longest bridge span in the Americas. Kick back and relax. You’ve earned it.